Although it may not be as popular as Qualcomm here in the states, mediatek is still one of the biggest name when it comes to mobile processors. The company has Launch its latest chipset for smartphones, and its the Mediatek Helio P70. On the technical side of things, the helio P70 uses an octa-core system with four ARM cortex A73 processors clocked at 2.1GHz. Along with that, there are another four Cortex A53 chips @ 2.0GHz. On the graphical side of things, we're Looking at a Mali-G72 MP3 System that can be used up to 900MHz (a performance boost of 13% compared to the helio P60). Gaming is often one of the most demanding tasks for any smartphones, And to make sure your experience here is as smooth as can be, The helio P70 is optimized to reduce frame-rate jitters and improve gameplay latency for in-game touch controls. Mediatek is also promoting LTE speeds up to 300 Mbs, an "enhanced AI engine" that offers a 10-30% processing speed increase, improved video call quality even with limited bandwidth, and a host of camera features including real-time beautification, scene detection, and augamented reality. 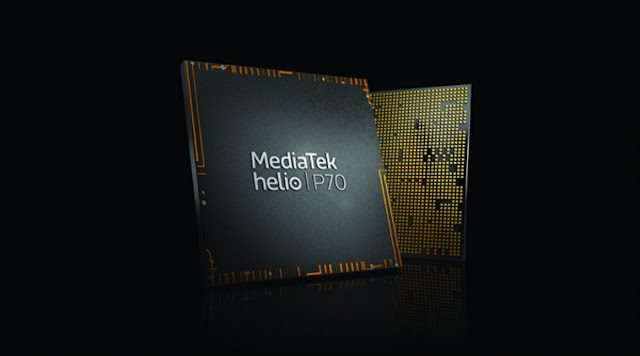 The mediatek Helio P70 is already is "volume production" meaning we should see smartphones powered by the new chipset as early as this November.